A UK & Ireland record crowd of 4,674 for a standalone women’s test match witnessed a superb all-round performance from England who recorded their largest total against France for nearly a decade. France started well with an early surge from Romane Menager reminding everyone what a threat she was going to be with ball in hand, but England settled into the game, with Emily Scarratt and Sarah Hunter's experience to the fore. England appeared to have opened the scoring after 4 minutes. The first scrum saw England under pressure, but great work by Sarah Hunter gained possession, with the ball worked out quickly to Sarah McKenna who cut through the French defence to score – but an infringement by Poppy Leitch holding off Menager at the back of the scrum was spotted on video and the try disallowed. But England did not have to wait long to cross the line again, with England’s players returning from 7s coming to the fore. A perfectly weighted kick from 7s returnee Emily Scarratt forced France to concede an England lineout 10m out on the left. An attempted England maul was only stopped illegally, but from the advantage a cross-field kick by Daley-McLean was fell for into the hands of another players back from 7s - Jess Breach - for the opening try, converted by Daley-McLean. 7-0 after 11 minutes. France did get down to the English 5m line midway through the first-half after a great break by Camille Imart, but the visitors were just too careless in possession in the face of a strong English rearguard, their scrum was turned over, after which England returned to the attack, with McKenna crossing the line after 23m only to be held up. Two minutes later England did score their second after Kelly Smith was just tackled short, the ball quickly recycled to Poppy Cleall to crash over. 12-0 to England. France had lost the ball in possession more than perhaps they should have done against Wales in week one, but had got away with it. Against England this was not the case, and lead to the third try. A yellow card against Vickii Cornborough after 33 minutes for a high tackle on French captain Gaelle Hermet did nothing to slow England down, Caroline Boujard being turned over in the centre of the field, a great kick ahead again from Emily Scarratt, and Kelly Smith on the end to score England’s third. 19-0 after 36 minutes. On halftime Jess Breach scored England’s fourth try, again an overambitious handling error by France handed the ball to Emily Scarratt, the ball being moved to McKenna and then Breach who made the most of a disordered French defence. 24-0 at halftime. France’s response was to change scrumhalf at halftime, Yanna Rivoalen coming on moving Bourdon to fly-half. Bourdon’s greater vision and time at 10 had an immediate impact, creating the space to put Safi N’Diaye in on 42 minutes, and a try of her own on 47m. 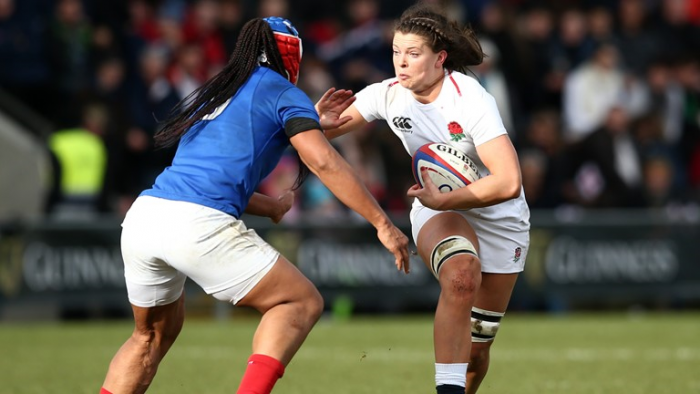 But France’s handling errors remained a problem, and in between those two scores a disordered defence following a turnover allowed Poppy Cleall to go went over for a fifth England try. With 30 minutes, England were well ahead at 29-12. The French defence had little answer to the England forward power throughout most of the game. Whenever England reached the French 5m line they seemed to score – and score quickly. Hannah Botterman went over for England’s sixth try on 58 minutes, and then Cath O’Donnell added a similar score six minutes later. England were racing away with the game with the record books being pulled out, but France finished strong. Aided by a yellow card against Zoe Harrison, France finished with two tries – and therefore a try bonus – with Bourdon and finally Romane Menager touching down in the final five minues. But ultimately France had been out-fought and out-thought. The risky French quick-passing game had resulted in errors against Wales, and against England these errors cost tries, which put France under more pressure, resulting in more errors. Even up front it was a far more even game than expected, with Sarah Hunter and Cath O’Donnell in particular having great games. France : 15. Caroline Boujard 14. Lan Jason, 13. Marine Ménager 12. Gabrielle Vernier, 11. Lea Murie, 10. Camille Imart, 9, Pauline Bourdon; 1. Lise Arricastre, 2. Caroline Thomas, 3. Clara Joyeux, 4. Lenaig Corson, 5. Safi N’Diaye, 6. Gaelle Hermet (c), 7. Celine Ferer, 8. Romane Ménager. Replacements: 16.Agathe Sochat, 17. Laure Traore, 18. Sabina Argagnon, 19. Audre Forlani, 20. Coumba Diallo, 21. Yanna Rivoalen, 22. Laurianne Lissar, 23. Doriane Constanty.